It is a modern, high-performance, basic set of NTA-free cleaning concentrates. 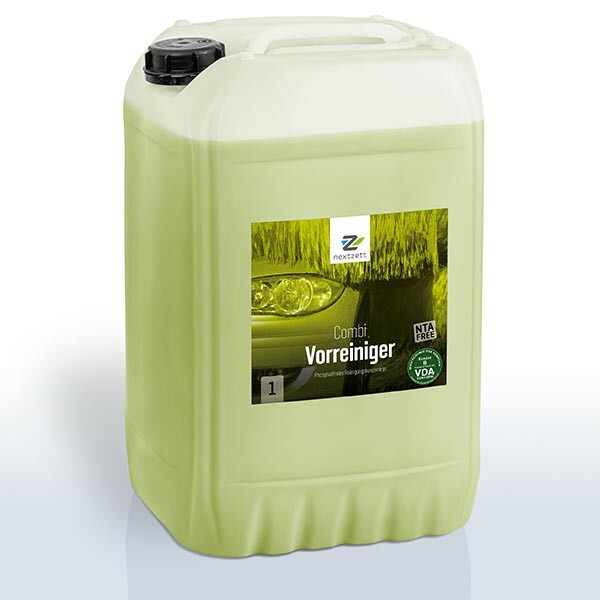 The efficient combination of nonionic and amphoteric surfactants reliably removes insect pollutants, bird flu, traffic film as well as fuel margins from over-filling. Very suitable for biological water treatment plants. nextzett Combi precleaner is a modern, high-performance, basic adjusted while NTA-free cleaning concentrate. The efficient combination of nonionic and amphoteric surfactants reliably removes insect pollutants, bird flu, traffic film as well as fuel margins from over-filling. The surfactants used are all very readily biodegradable and are completely unproblematic in the treatment of industrial water; Which guarantees a high water recycling rate and thus saves costs. nextzett Combi precleaner is due to its composition excellent as widely applicable cleaner body and wheels in the car pre-treatment, in particular for effectively removing of pigment dirt and strong grease and oil. The cleaner contains an effective evaporation protection; Which provides additional application safety, despite alkaline formulation. nextzett Combi precleaner contains specific, protein-dissolving ingredients that are able to completely remove otherwise difficult to remove Chitinrückstände and other heavy dirt already in the pre-wash.